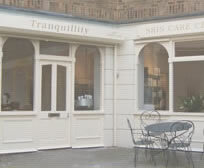 Tranquillity Skin Care Centre is more than just another beauty salon. Our aim is to provide excellence in customer service...and our mission is to create the perfect treatment for you. of today and concentrate on being revitilised and rejuvenated. We make no compromises on the products we use. For skin and body care we recommend and use Dermalogica products. For years, Dermalogicas formulas have pioneered new standards for product performance and helped us establish our Salon as one of the elite in the United Kingdom. The experience starts from the moment you walk through the door and with late night opening four nights a week, an oasis of calm awaits you after a hectic day.